The Cabo pendant light by Tech Lighting is simple yet visually engaging with its warm color and modest size. 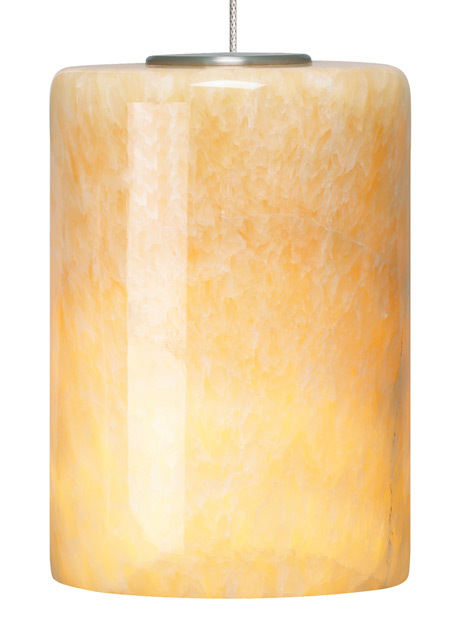 This natural onyx cylinder provides a warm textured look as the light shines through the stone shade. With its warm attributes, the Cabo is ideal for kitchen island task lighting, bedroom lighting flanking an end table or hallway lighting. The Cabo ships with your choice of Halogen or LED lamping. both options are fully dimmable to create to desired ambiance in your special space. Pair the Cabo pendant with the Monorail system by Tech Lighting for greater design customization.